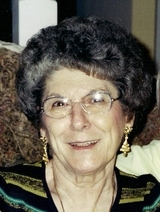 Obituary for Wanda (Barger) Myers | Loudon Funeral Home and Cremations, Inc.
MYERS, WANDA BARGER - age 72 of Sweetwater Rd., Paint Rock community, Philadelphia, passed away Tuesday, March 16, 2010 at Parkwest Hospital. Wanda was a member of Paint Rock Baptist Church and well known for her crafts & quilting ability. Preceded in death by father, Lawrence Barger; mother, Sophia Hyde Barger. Survivors: husband of 55 years, Franklin "Bud" Myers; sons & spouses, Jeff & Rachel Myers, Loudon, Roger & Stephanie Myers, Athens, Kevin Myers, Paint Rock; 5 grandchildren. Funeral services 7 p.m. Thursday Loudon Funeral Home Chapel. Rev. Keith Kile & Rev. Jeff Myers officiating. Interment 11 a.m. Friday Paint Rock Cemetery. Visitation 5-7 p.m. Thursday Loudon Funeral Home.